Enjoy the June 2015 issue of the Cursillo newsletter, The Evangelizer! When we hear about the School of Leaders, we tend to have mistaken concepts about it or identify it as a center for education or formation of leaders to give talks on the weekend. The School of Leaders is the working arm of the Secretariat. In simple terms, the School is made up of a core group of leaders for the Cursillo Movement in a particular Diocese. They are those leaders who have an intense desire to do whatever is necessary to ensure the Movement remains vibrant and authentic … leaders who are willing to give their time, talent, and treasure to the Movement, as needed. The School is and will always be an essential piece for the continuation and development of the Cursillo Movement. In other words, if there is no School, there are no Cursillo weekends and there is no Secretariat. At this point, I can here you saying, “School of Leaders, that’s not for me. I am not one of those people called on to be a leader in the Movement.” The reason I can hear those words so clearly is because when I heard about the School of Leaders, I said the same thing. The truth is, not all Cursillistas are called or choose to become Cursillo Leaders. Those behind the scenes are as important in spreading God’s message as those who may be comfortable out front. The School of Leaders is NOT a school in which someone learns to be a leader …as indicated on page 24 of the Leaders’ Manual, “One is not a leader because he belongs to the School; rather he belongs to the School because he/she is a leader of Christianity.” A more apt name for the School might be, Community of Leaders, Reunion of Leaders, Community of Respondents (those responsible for others), or even the School of Followers. However, keeping in line with the Cursillo literature and terminology, we will refer to it as a School. The School of Leaders is not a school in the academic sense. It is a forum to educate and discuss various aspects of our own holiness, formation, evangelization, and our Catholic faith. The School energizes and drives the Cursillo Movement towards that Ideal, giving direction and purpose to the Secretariat, and giving constancy and perseverance to the Fourth Day Community. 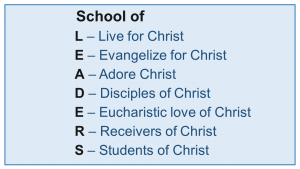 As Leaders of Christianity, the School helps each of us accelerate and live the fundamentals of being a Christian: IN ONESELF – IN THE MOVEMENT – IN THE ENVIRONMENTS. During the 3-day Cursillo weekend, the talk on Leaders asks each of us to lead the people in our families, our churches, and our communities, to know the love of Jesus. Now that we have experienced just how much Jesus loves every one of us, He wants us to share that love with everyone else we meet. We are a pilgrim people, always in process, always growing – we continue our formation scripturally, prayerfully, and apostolically, and the School of Leaders provides a place for continuing our growth in our faith journey. All Cursillistas are encouraged to participate in attending the School of Leaders to enrich their Fourth Day experience. The School of Leaders is not a school to train speakers for the weekend. 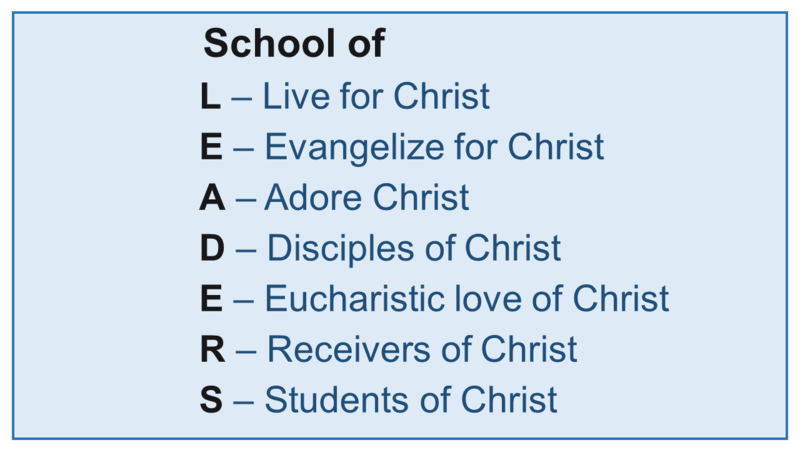 The School of Leaders is an opportunity to develop into Catholic Christian Leaders in the community. Whether or not you want to be a team leader in Cursillo, we would love to have you join us so we can all help each other continue to grow in His love. The School of Leaders is open to all Cursillistas, and we encourage everyone to attend. Come and enrich your understanding of the Cursillo. The School of Leaders meets on the second Tuesday of the month at 7 pm at St Joseph’s in Freeburg. Let us remember and reflect on, “Do we put into action what Christ has commanded us?” Christ is counting on me, and I on Him! Since the last time I penned a missive for this newsletter several very interesting things have taken place. The first is a two-part interview of the national leadership of Cursillo that aired on EWTN. You can watch what aired on the National Cursillo Web page (www.Cursillo.org) under the “resources” section of the Web page. They reminded us of the importance that Cursillo can and does play in the Church’s call for a “new” evangelization. I would encourage you to go and take a look at it. The second is that our Holy Father, Pope Francis, has called for a Holy Year to be celebrated: an “Extraordinary Jubilee of Mercy.” This Holy Year will open on 8 December 2015, the Solemnity of the Immaculate Conception, and will close on 20 November 2016, the Solemnity of Christ the King. So we have a unique and wonderful time ahead of us in the Church. The Bishops will meet this fall to continue the discussion of the role of the family in society and the Church in this time of strained understanding of what it means to be family and Church. Let us pray that the gift of the Spirit of God may guide them in their discussions. We are reminded, time and again, by our Holy Father that the ultimate gift of God’s love and mercy are what calls each of us to be children of God. It is also what calls each of us, in the gift of the Holy Spirit in our initiation, to become the disciples that Christ calls us to be. Make a friend, be a friend, and bring that friend to Christ. As I write this in the week before the Solemnity of Pentecost, my prayer for all of you as we enter this summer season, is that the Spirit of Christ may be with you to guide you and keep you always in the love and mercy of God.